Fires in Northern California – I Commend Joy! We had thunderstorms on Saturday, which are both rare and also spawned hundreds of fires in the mountains. 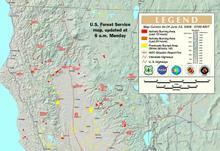 You can see the number of fires from the lastest forest service map. News articles here and here. Update here.